The RAPP Campaign invites you to add your story about aging behind bars. Speak from the heart. Share your experience. An Arkansas Department of Correction prisoner died Monday afternoon while working on a construction project at the department's Ester Unit in Pine Bluff. 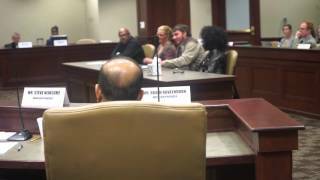 Four formerly incarcerated people testified about their experiences at the Arkansas Legislative Criminal Justice Oversight Task Force. Arkansas CURE is so proud of these great people and thankful to have played a part to make this happen.